School has started and I should be in bed. It’s early…or it’s late…depending on who you ask and what their personal day rhythm is like. Considering I have to get up at 6:00 and should be aiming for 8 hours of sleep, I’m going to go with “it’s late”. My groupmate Batel and I were assigned a patient together and after the session was done, we stayed after to ask our substitute teacher questions about our patient’s diagnosis. The patient was quite old, very weak and had a violent cough. We were able to find that his/her heart was enlarged, but nothing past that. (Every time I have to present a patient…). The doctor shared that the patient suffered from dilated cardiomyopathy and had acquired bronchopneumonia while in the hospital. The cause of the heart condition was chronic alcohol abuse, which we wouldn’t have been able to diagnose during our examination because the patient had told us that he/she had never consumed alcohol. (How I feel when the patient tells me one thing and then tells the attending something completely different). Despite the long day, I’d planned quite the study load. By 19:00, I couldn’t stop yawning enough to read a sentence. I decided to give bed a try…and what a bad idea that was! All that happened was a short nap, some angry attempts at falling asleep and then a bunch of searching in the app store for the perfect apps for my books and schedule. Exciting, right? And now, I’ll show how awesome these apps are. Technology is amazing! These will be my 3 main school apps. Last semester, I switched over to taking most of my notes on my iPad. It was a bit of a tough transition, but I’m really enjoying it. In fact, I’m noticing that I prefer how fluid the information is! Nothing I write is committed for eternity. It can be copied, enlarged, flipped, recolored – you name it! 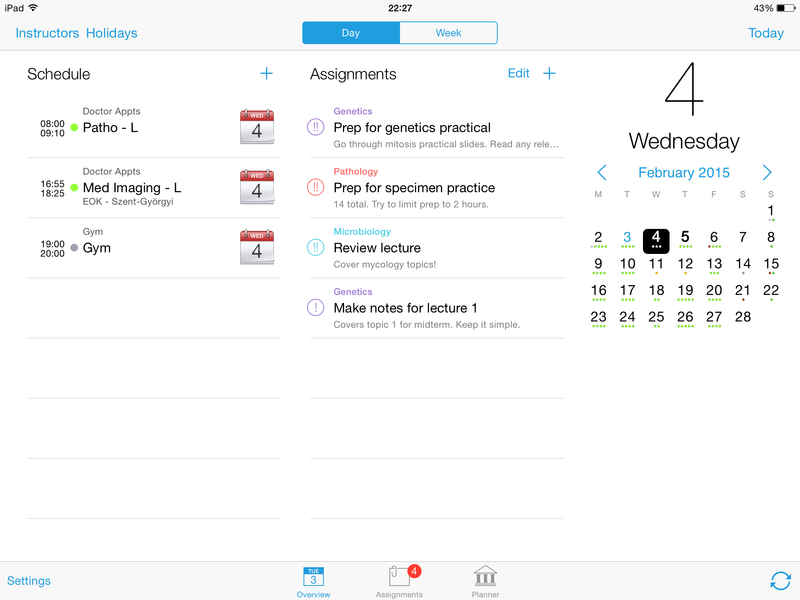 iStudiez Pro will be my planner. It copied over my schedule from my calendar, so I didn’t have to input everything again. I’ll be using it to keep my study tasks organized. 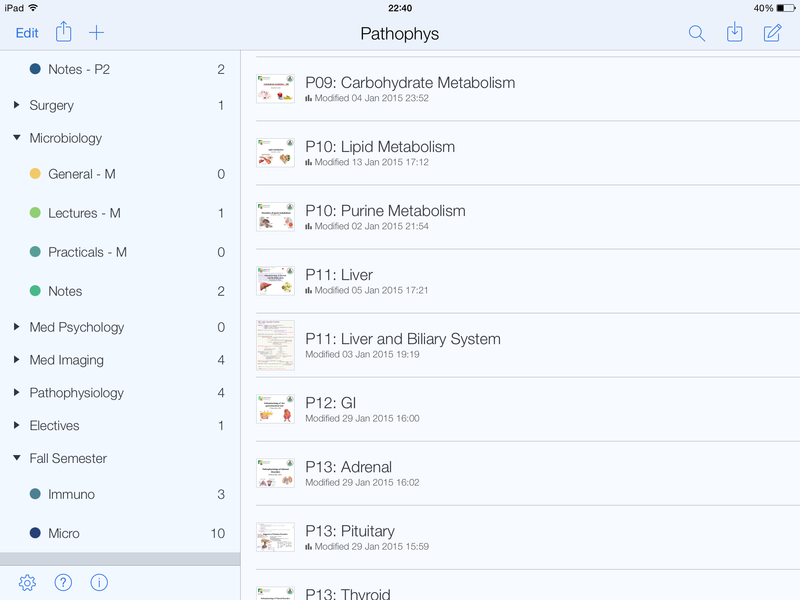 You can access each of the subjects individual to see the tasks assigned to them. 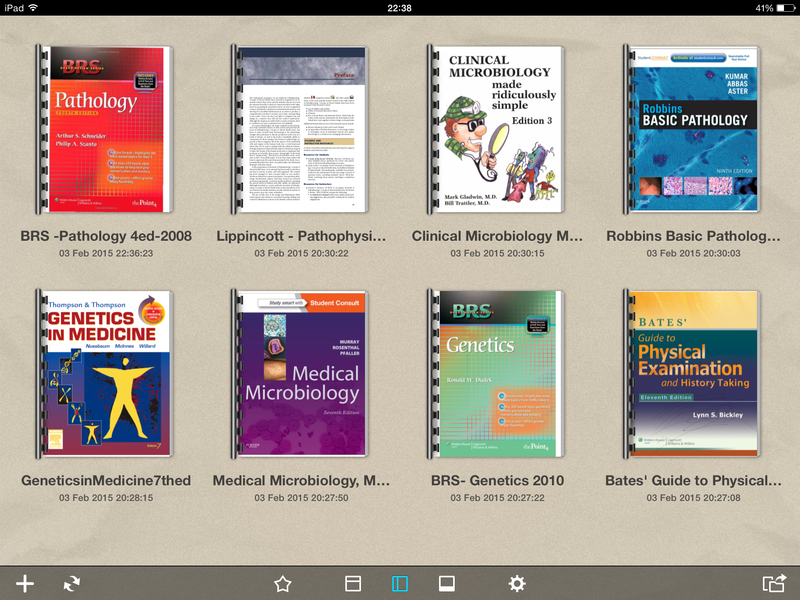 UPAD is a notetaking app, but I’ll be using it for my books. 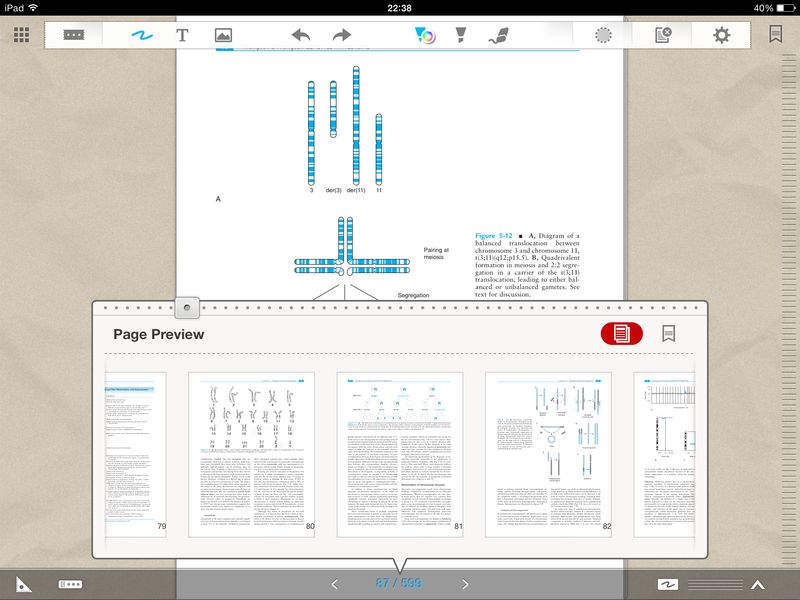 I’ve been using GoodReader until now, but really don’t like the interface. I wanted something as intuitive as Notability (see next), but needed a different program so that I can use them simultaneously. 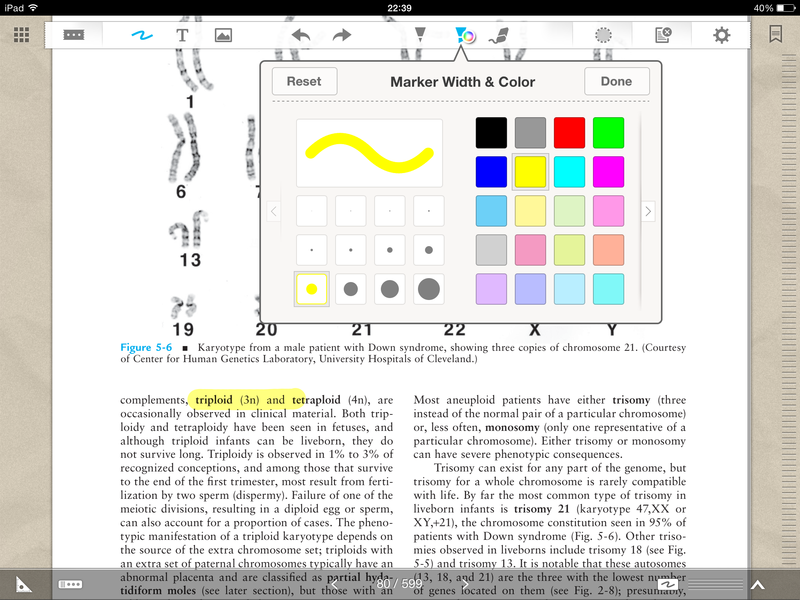 This one has a feature that makes it much easier to scroll through hundreds of pages, so it is actually much better than Notability when it comes to large files. 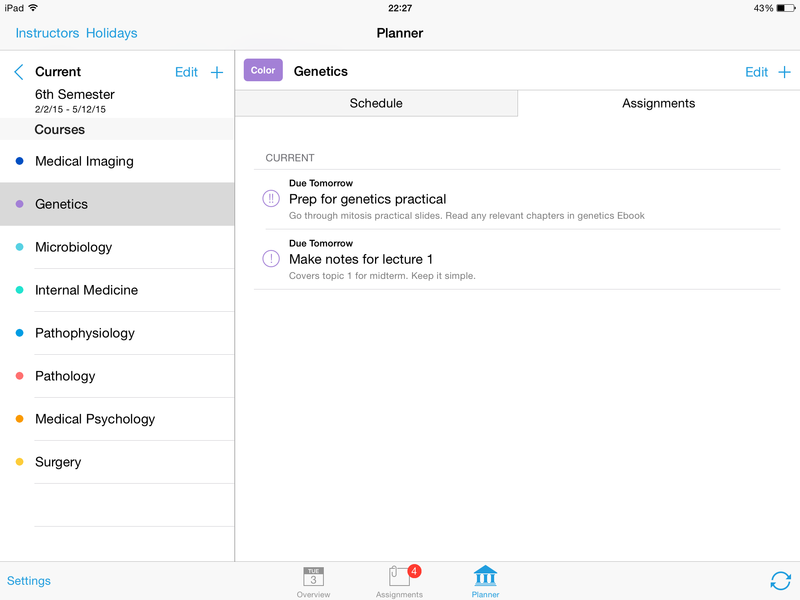 It will allow me to highlight, take margin notes and take screen shots to input into my notes in Notability. Last is my absolute favorite – and my lifesaver! 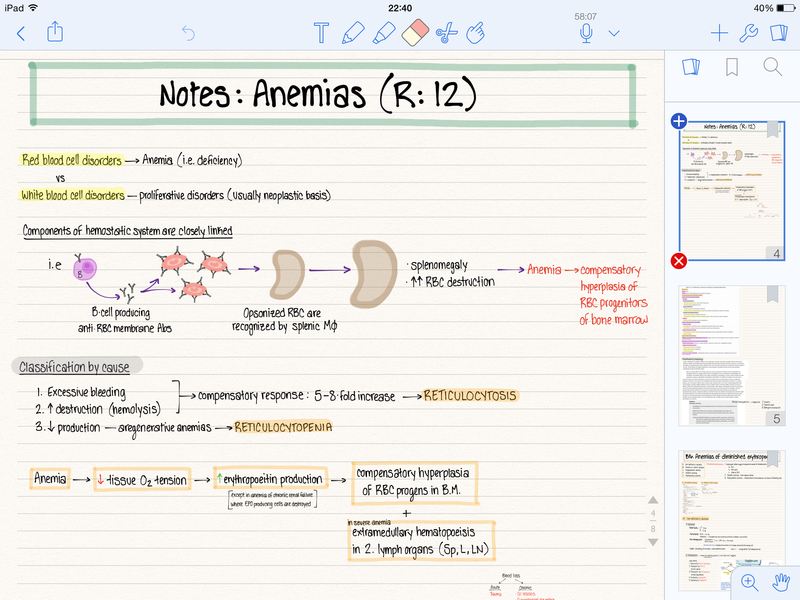 Notability. I used this program all last semester and I honestly can’t recommend it enough. 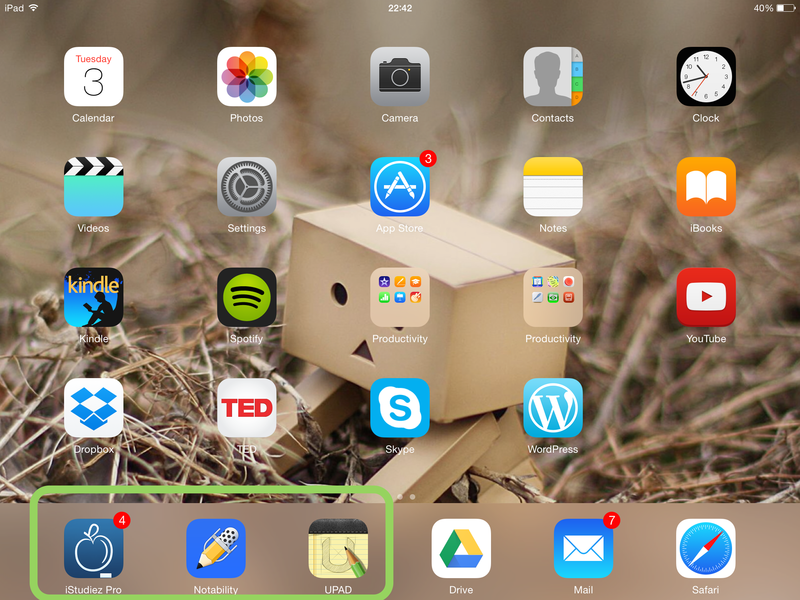 It has an iPad app as well as a MacBook version and they synchronize automatically over iCloud. Everything backs-up to Dropbox anytime I change a file, so I never have to worry about losing anything. I can take pictures and input them into my notes, plus take audio that follows along with any notes I make. I take all my notes directly into the program using my stylus. A little getting used to – but so worth it! 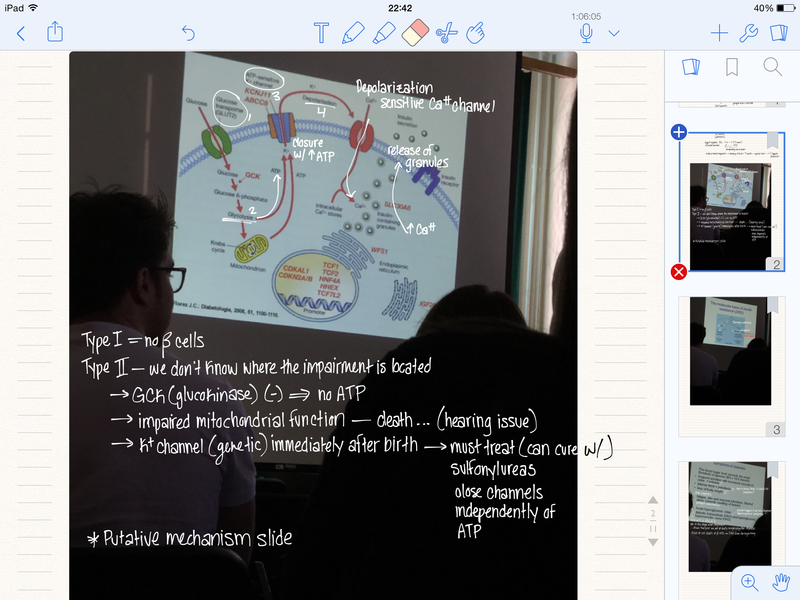 Here’s an example of how iPad note-taking trumps paper notes. 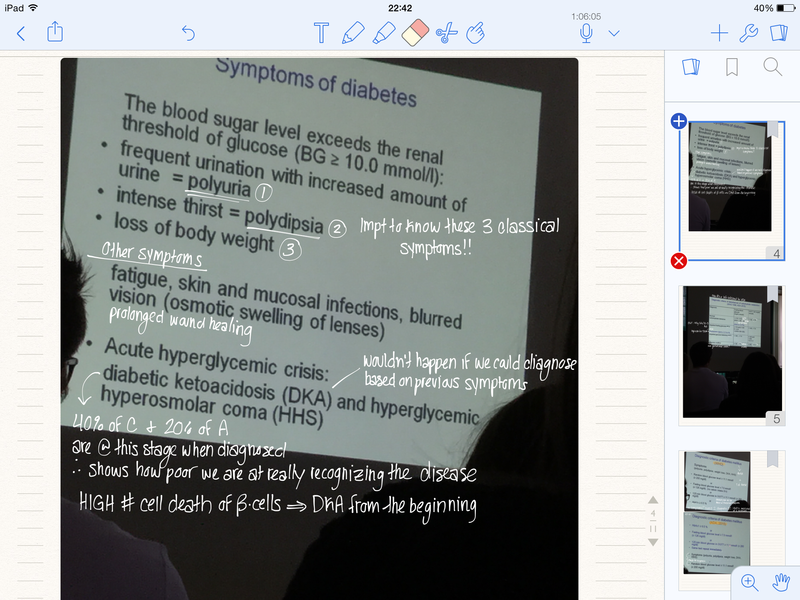 This is from today’s internal medicine lecture. I wasn’t able to get down all the info in time and there were some complicated diagrams, so I just snapped a picture and drew directly on it. Saves me so much time (and confusion) later! § 4 Responses to 6th Semester’s a go! Nice to know I’m not the only one :). I wish I could take the time to really figure out what my natural biorhythm is, without the stress of school/studying, but I don’t think I’ll have that chance before I retire. I like mornings, so I hope I get back to the way it was. Plus, with 8 a.m. classes every morning, I need to adjust soon! Hey, what stylus do you use for your iPad, looks amazing! You are currently reading 6th Semester’s a go! at Buda-B.